I have been talking about Nerium AD all week and have come to the conclusion that it is nothing more than a glorified aloe cream. The first and second ingredients are aloe. The nerium content has to be very minimal due to nerium's toxic nature. It has protein in it too, but protein molecules are too big to penetrate the skin and they do not fill in lines or stimulate collagen production. Collagen and elastin proteins are used as moisturizers. They are derived from bovine sources. You don't have to spend $80-$110 to buy a nice aloe product. You can find many aloe products in stores that sell natural products for $10 or less. As I said previously, I like aloe it is very hydrating and soothing for the skin. Aloe leaves contain a clear gel that can be used on the skin. It has a slippery feel and creates a tightening feeling on the skin as it dries. It makes the skin look plumper and healthier. Aloe was used 6000 years ago by the Egyptians. It has been used for years topically and orally as a folk and traditional remedy for a variety of ailments including acne, eczema, psoriasis, rosacea, dry skin, dandruff, indigestion and other stomach issues, diabetes, asthma, burns and sunburn. It has anti bacterial, anti viral, anti fungal and anti inflammatory properties. It has not classified as an active anti aging ingredient, though. It may cause irritation in some people. Some people can be allergic to it since it is a plant extract, but that doesn't make it a bad ingredient. People who are allergic to garlic, onions and tulips are more likely to be allergic to aloe. Here are a few inexpensive aloe products that have nice ingredients to soothe and give your skin a moist, hydrated, younger look and feel. 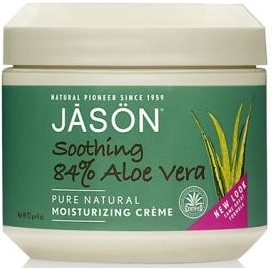 An aloe moisturizing cream from Jason. I hope my series on Nerium AD has been informative for you! Always do a little research before you spend a lot of money for a skin care product that makes big promises.